The Duchess of Cornwall attended The Royal Artillery Gold Cup races held at Sandown Park in Esher today. 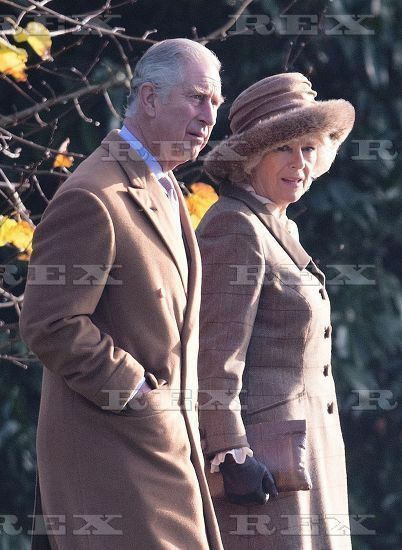 For this informal day out, Camilla understandably chose an informal (and warm!) hat. Describes by the designer as a”ruched crown showerproof tweed hat with faux-fur cuff”, we have seen Camilla wear several different versions of this hat numerous times. I think this version is most successful – the colouring is lovely on the Duchess and the hat coordinates nicely with her tweed coat. If she had worn this to a formal royal engagement I would not be so complimentary but for for a wintry day of leisure outdoors, I think this cozy hat works rather well. Photos from Getty as indicated. Click on each photo to link with the original source. For the record I think this hat is okay. Put it this way, I have at times had much stronger negative reactions to particular hats than what I did to this one. I guess that means I don’t mind it. I think it suits Camilla and the occasion and the weather. Thanks. I don’t like this hat. I agree with what Empress Pandora says: February 14, 2015 at 6:43 pm, the whole look is dated. I also agree with what Tatsuya Kuniyoshi says: February 13, 2015 at 7:20 pm. I also agree there are a lot of negatives here. Personally, I think the Duchess should stick to the Philip Treacy hats. Camilla’s hat, and indeed her entire outfit, looks very dated. I don’t like the Duchess of Cornwall’s hat at all. The color and shape are very unflattering to her. In fact, I don’t think this hat would flatter anyone. A splash of color would brighten this outfit, hat not too bad. This hat has a lot of negatives going for it. The tones are drab, and do not compliment her complexion or hair or eye tones. The faux-fur is ugly and sets a bad example to people that wearing fur is a good thing. The proportions of the hat seem off and do not compliment her head and face shape. The hat does not work with her outfit. There is no harmony. The Duchess of Cornwall has proved time and again that she can do much better than this on the millinery front. The Duchess of Cornwall always looks so elegant, classy, and appropriate. Love seeing her and love her hat styles. I don’t like this hat or the other versions of the Paddington Bear inspired hat. If I must pick a version, then I agree that this is the most successful of the Duchess’s several versions of this hat. I wouldn’t wear any of these hats. I agree that this is the most successful of the Duchess’s several versions of this hat. From a distance it coordinates well with the coat. When I see it from straight on, I wish the hat’s so-called “faux-fur cuff” had a similar color or texture to that in the collar and button, however. The whole outfit looks appropriate for this outing, and I like its shape. I agree – this goes well with the coat and is perfect for an informal day. She doesn’t look right in the Paddington hat for formal occasions, biut today it was just right. It must be cold. Nice outfit. Oh lucky you beachgal. Here on the East Coast, it is much colder. I actually like that hat on the Duchess. She looks warm and toasty. That hat would not go with some coats, but I agree with the Hat Queen: it does coordinate nicely with the tweed coat for an informal occasion. I really enjoy seeing the Duchess of Cornwall. These are great pictures.